Is that rumble in the air ARCA Racing Series Presented by Menards engines revving or something more? Fans are advised to keep an eye out for a large green dinosaur circling the Kansas (Kan.) Speedway on Friday, October 14, as Michael Self makes his debut with Ranier Racing with MDM in the No. 28 Sinclair Chevrolet. Self has teamed up with Sinclair Oil Corporation to celebrate the company’s 100-year anniversary. With executive offices in Salt Lake City, Utah, Sinclair’s partnership with Self, a 25-year-old Utah native, is one of shared roots and pride. “This weekend is undoubtedly one of the most exciting of my career,” Self said. “Making my return to racing with Sinclair backing me, and Ranier Racing with MDM equipment is a huge opportunity for me. Self capitalized on his five NASCAR K&N Pro Series West seasons, collecting six victories, and 22 top-five finishes, as well as 34 top-10 finishes, with an average starting position of 7.8 and producing an average finishing position of 9.9 across just 58 starts. 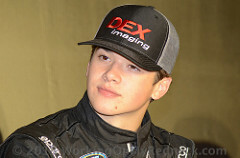 In addition to his successful NASCAR K&N Pro Series West campaign, Self was named to the 2013-2014 NASCAR Next class. He also has seven starts in the NASCAR XFINITY Series. He has two starts in the ARCA Racing Series. This weekend marks Self’s first appearance at the Kansas Speedway with the ARCA Racing Series. However, the Utah native has one previous start in the NASCAR XFINITY Series at the 1.5-mile tri-oval track. With four turns of opportunity at the Kansas Speedway for a Dino, the dinosaur sighting, Self is encouraging fans to welcome Sinclair to the ARCA Racing Series by sharing their pictures of the car across social media using #SinclairSELFie. The Kansas 150 will be broadcast live on FS1 on Friday, October 14 at 7:30 p.m. (CT). 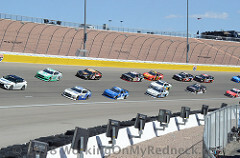 It will also broadcast live on www.arcaracing.com with the addition of timing and scoring. To keep up-to-date with the latest news, information and exclusive content, visit Self’s Twitter page – @MichaelSelf and Instagram @Michael_Self. You can also “like” his official Facebook page at /MichaelSelfRacing.